(PhysOrg.com) -- Solar flares are amongst the most dangerous cosmic phenomena man has ever known. Though they pose no harm to humans, their effect on technology is vast. When they occur, they possess the capability to knock out satellites orbiting earth and bring down power grids that provide electricity to millions of people. In order to avoid catastrophe physicists around the globe are working to accurately forecast these solar flares. Their jobs just got a little bit easier. In order to make their predictions they are revisiting sunspot drawings from the 1700s. Since the flares occur most commonly during a period called the solar maxima, scientists have been recording the events for quite some time. The solar maximum is the time when sunspots appear in their greatest quantity on the sun. The records however are incomplete thus making accuracy difficult. However physicists have determined there is an average of 11 years between solar maxima. Predicting the exact timing and height of the peaks is difficult due to the lack of data available. Since plausible complete records have been kept, approximately 24 solar cycles have passed. However a historical analysis now suggests that a solar cycle from the 1700s was missed by the record keepers. Swiss astronomer Rudolf Wolf compiled the record in the 19th Century basing his work off of the solar drawings of Johann Staudecher, an Austrian amateur astronomer. However between the years of 1784 and 1799, he recorded only 1 solar cycle, the lengthiest on record. That fact has long been questioned by astronomers who note that Staudecher's observations were few and far between. In the latter half of 1793, there were only 2 drawings. As early as the 19th century, people proposed that there might have been two short solar cycles rather than 1 long one. Now an effort by Ilya Usoskin of the Finnish University of Oulu re-examined the original drawings of Staudecher. The drawings are housed at the Astrophysical Institute in Potsdam, Germany. They also used sunspot drawings made by James Archibald Hamilton and his assistant at the Armagh Observatory in Ireland from 1795 to 1797. They used the number of sunspots as well as their location on the solar surface to make their observations. Sunspots are most likely to appear 20 to 30 degrees from the solar equator at the start of a new cycle. As the cycle progresses however, they begin to show up closer rarely appearing more than a few degrees from the equator by the end of the cycle. Usoskin noted that while Wolf used Staudecher's drawings, he only used them to count the number of spots not to determine the location of the spots themselves. According to the team's analysis, around 1793, a new, weak solar cycle began. The sunspots appeared at about 20 degrees from the equator in Staudecher's drawings. In Hamilton's 1795 drawing there is a sunspot at 15 degrees. Apropos a singular long cycle, we have instead two cycles last nine and seven years respectively. This has in turn led to a re-thinking of solar cycles. Statistics previously held that long cycles are followed by short cycles. But since that was partially based on the supposed 15 year cycle between 1784 and 1799, the validity has been called into question. 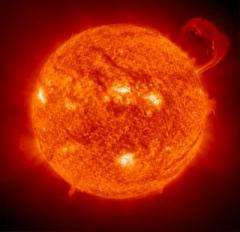 For now physicists will keep on using sunspots and solar cycles to predict solar flares and hopefully as time wears on, we will be better suited to avoid the catastrophic effects they entail. no sun spots. maunder minimum all over again. better crank up those coal fired furnaces. . . . it's fixin' to get, brrr, cold. Anyone hear about the solar flare thats supposed to "devastate" the earth in 2012? James, That within the large scope of the greater 2012 prophecy, but no one ever said that it or any other catastrophe would actually happen in the specific year of 2012. This supposes that we are really in 2009, and that the Mayan calendar started 3597 years ago ... which it may have done. However, as the Mayans did not last long enough to see their count of years concluded, and the Roman calendar managers have been a little less than accurate or thorough, we may yet have up to three hundred years before the true end of the Mayan 3600 year cycle. Ref: Phantom Time ... the adjustment of Julian to Gregorian calendars may not only have changed the count of days to suit the observed seasons, but may have introduce two to three hundred years of false history to permit Otto the Third to sit in power at the 'end of the first millenium'. Strange theory. Interesting arguments. Possibly explains some of the carbon dating problems for "historical documented" samples, and the marked decrease in technologic and artistic development during the "medieval" period.